The debate has raged on for decades with no end in sight. I live among a group of artists, family, friends and acquaintances. Some are professional, some amateur, some teach the subject in public school and others at college level. I find nothing more provocative than dropping the “what is art” bomb in amongst any gathering of these folks. In as much as no mutually satisfactory answer has ever emerged from within this group I am posing the question, reductio ad absurdum, to you. So, what exactly is art? 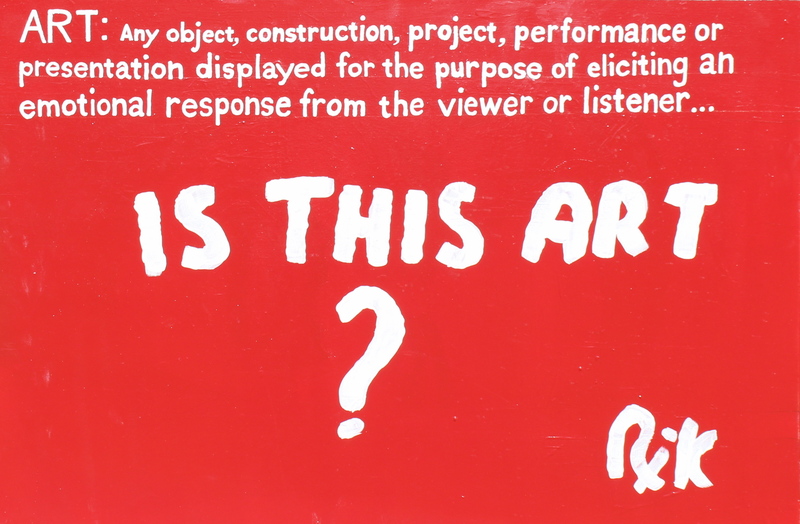 1 Response to WHAT IS ART? My family finds your collection of various and sundry flotsam, jetsam, and signage to be art. Thankfully we are not considered trespassers and will, therefore, avoid being violated.